Whether you’ve done a thousand live gigs or just starting out, this workshop gives you tools to take the stage with complete confidence EVERY time — without “choreography” or canned movement! This is the most complete presentation of the “Tom Jackson Method.” You’ll learn how to revolutionize your concert into an unforgettable experience for your audiences—and all without “choreography” or canned onstage movements. Most beginner music artists mistakenly believe that they need only to scribble a set list and sing the songs to satisfy an audience. In this amazing system, Tom asks and answers the question, “If you songs don’t all sound the same, why should they look the same?” With simple adjustments and practical stage principles, you’ll never have to guess how your shows go over again. The ALL ROADS LEAD TO THE STAGE 7-DVD Set will take your concerts to a whole new level of appeal. Whether you’ve done a thousand live gigs or you’re just starting out, this workshop will never let you take the stage without complete confidence again! In 17 sessions on 7 DVDs, Tom covers things like asserting your authority onstage, developing a clear vision for your show, techniques to inspire & enhance originality, creating spontaneity, and more! Live Music Producer Tom Jackson is a master at creating unforgettable “moments” in artists’ concerts. In this workshop, Tom teaches and works hands on with artists to show you how to create those moments in your show. 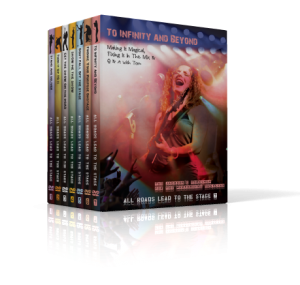 Artists and bands that have “made it” know that All Roads Lead to the Stage – and these DVDs are one of the best investments to make YOUR live show a success! You could spend over $1,500 on this workshop. Take advantage of this package offer from Tom Jackson today!